Larry Johnson, PE, DBIA, PMP, serves as the First Vice President on the WDBC Board of Directors. In this role, he fulfills the duties of the Treasurer including chair of the Budget and Finance Committee and member of the Executive Committee. Larry has 39 years of design, project management, program management, construction management, and design-build experience in the water and wastewater industry. 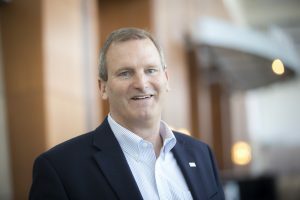 He has worked for both engineering and at-risk construction companies on some of the world’s largest and most complex water and wastewater programs in the United States, Australia and Europe. For the past 24 years he has been focused exclusively on collaborative delivery and has completed more than 18 design-build and construction management at-risk projects. Larry leads HDR’s water business group’s collaborative delivery program for the west and north central regions of the United States and teaches HDR’s collaborative delivery training classes. Larry holds a BS in civil and environmental engineering from Clarkson University in Potsdam, NY. He is a registered professional engineer in California, a certified DBIA professional, and a project management professional with the Project Management Institute.